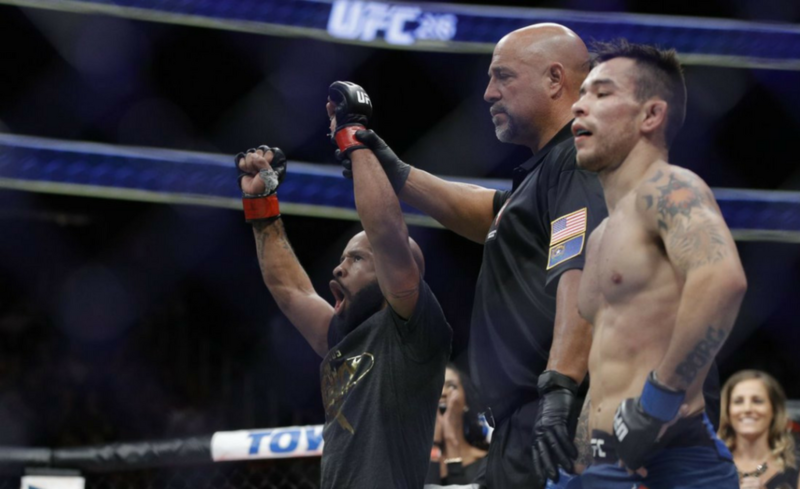 Demetrious Johnson submitted Ray Borg with a mind-blowing transition from suplex to armbar to break Anderson Silva’s title defense record at UFC 216. In the leadup to UFC 216, we predicted that Demetrious Johnson wouldn’t just break Anderson Silva’s record, but he would do it in style. Credit to “Mighty Mouse” because he gained maximum style points for this submission victory. Demetrious Johnson lifted Ray Borg up above his head before catching his arm in mid-air. As Borg was falling and bracing for impact, Johnson was already in position to finish the armbar. Johnson cranked at Borg’s arm and although reluctant at first, Borg eventually tapped. This was Demetrious Johnson’s moment. 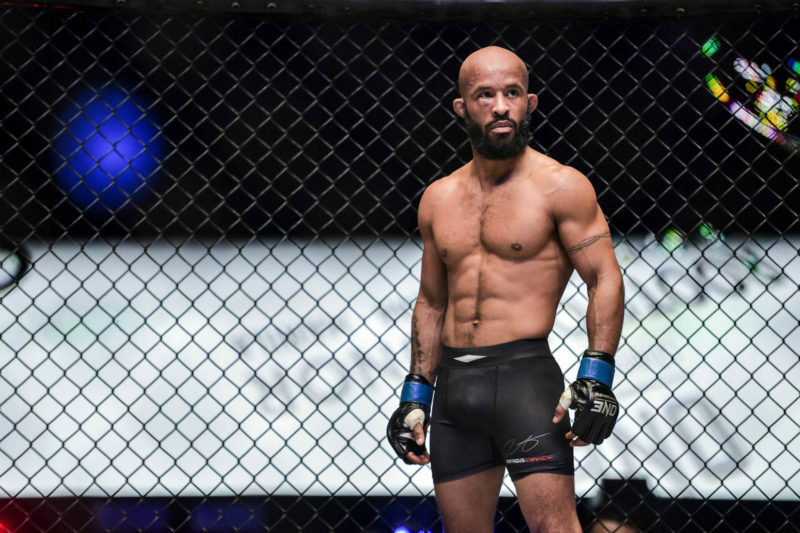 By defeating Borg, “Mighty Mouse” had secured his 11th consecutive title defense and broke the record previously set by Anderson Silva. With his win tonight, his win streak moves to 13 consecutive wins and he now equals Jon Jones for the second-longest winning streak in the history of the organization. Johnson’s next record in sight? Anderson Silva’s record of 16 consecutive wins in the UFC. Demetrious Johnson is the only champion that the UFC’s flyweight division has ever known and he now has held the title for over five years. He won the UFC Flyweight Championship on September 22, 2012, and there’s no realistic end date to his reign right now, either. Johnson maintains his #1 spot in our Flyweight Rankings and Borg keeps his position at #5 after UFC 216. 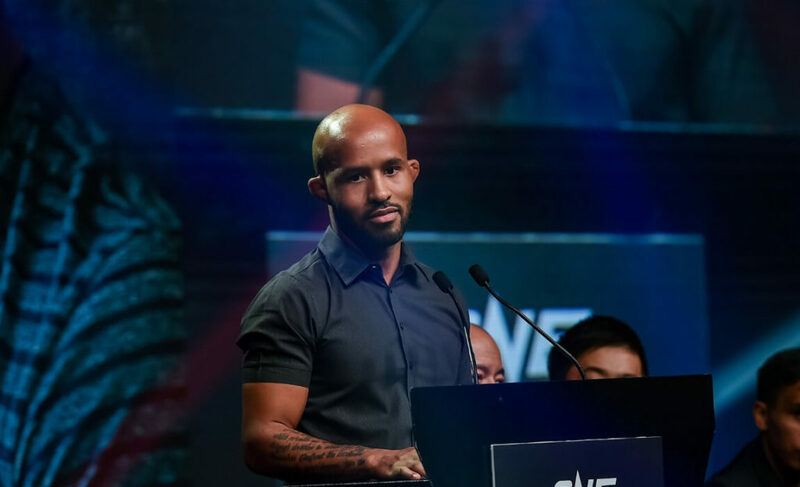 Demetrious Johnson vs. Ray Borg was a systematical beatdown that really only “Mighty Mouse” is capable of doing. 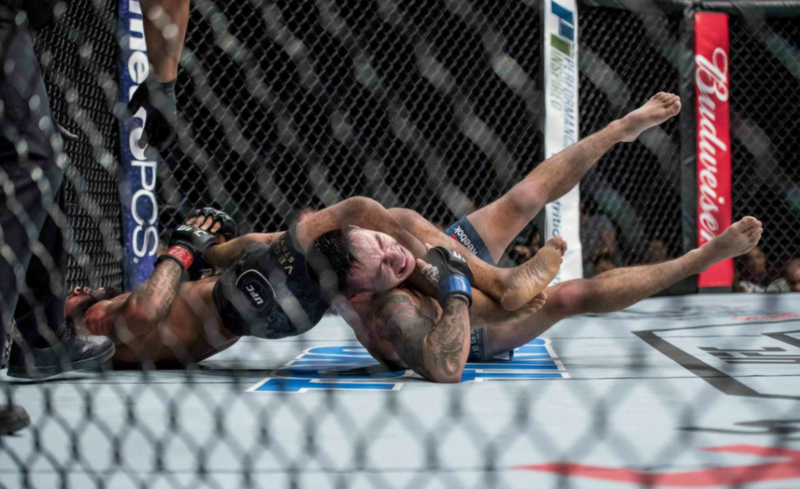 In the first round, Johnson started to chip away at the lead leg of Ray Borg. The game plan was clear, use the inside leg kick to slow Borg down. Demetrious then started mixing up his left kicks to the body and head. The first scramble came and went as quickly as we realized that what many people thought to be Borg’s biggest advantage in this fight, wasn’t an advantage at all. Demetrious Johnson was beating him in the scrambles and was the first opponent Ray Borg has faced to do so. Demetrious was planting vicious elbows into the face of Ray Borg from all kinds of positions. He worked from half guard, side control, mount, crucifix and was even attacking from inside Borg’s full guard. Every time Demetrious attempted a takedown, Borg would try and lock up a guillotine. However, ever time he did so, “Mighty Mouse” would pass to the opposite side of the guillotine and nullify the choke attempt. This happened over and over. Demetrious Johnson was most effective from side control on the mat. From this position, he would alternate his attack between kimuras, the arm-triangle choke and also keylocks. Borg was consistently having to deal with submission attacks. With this added pressure of considering Demetrious’ submission attempts, Demetrious would use these moments to transition through Borg’s guard when he was not suspecting it. 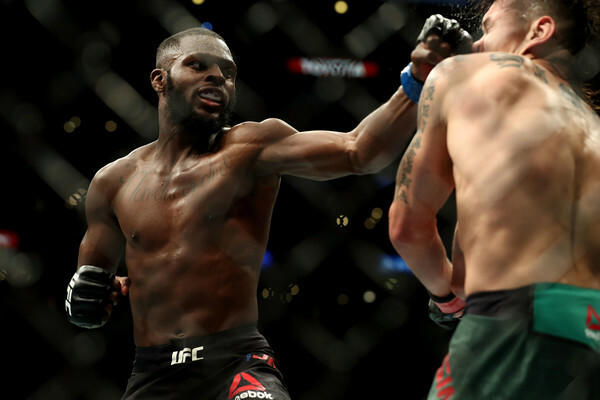 In the first round, Borg was excellent at preventing Johnson’s full mount, but by the third and fourth rounds, he was having to worry about Johnson’s submissions too much. Borg still had plenty in the ‘tank’ the time that the fourth round swung by. He lifted “Mighty Mouse” up and slammed him to the mat to start the round. Johnson chose to play butterfly guard before transitioning back to his feet. 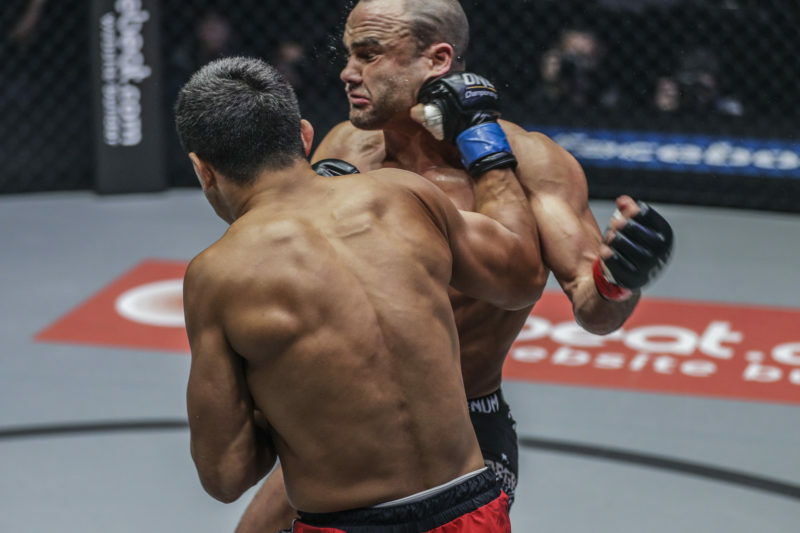 The round would play out the same as the earlier ones, with Demetrious applying heavy top pressure and consistent submission attempts while regularly beating down on Borg. The finishing moment needs to be seen to be believed. In the fifth and final round, Demetrious Johnson lifted Borg up from behind with a body lock. He went to slam Borg over his head, but while throwing Borg to the mat he transitioned the throw into an armbar attempt while in mid-air. It was unbelievable. Johnson applied pressure to Borg’s arm and forced the 24-year-old to submit. Let’s start by saying that Ray Borg looked great in this fight. Great isn’t good enough against Demetrious Johnson, though. In fact, excellent isn’t even good enough to beat “Mighty Mouse”. 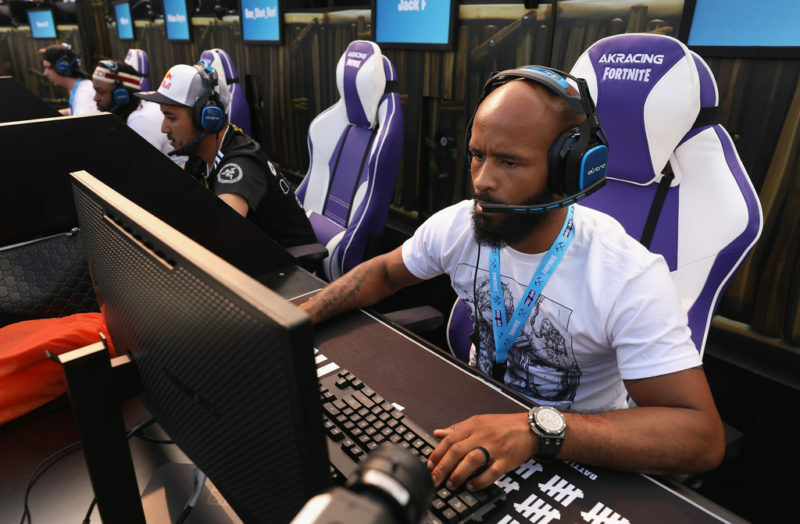 Demetrious Johnson was perfect from start to finish and he capped off this win with a spectacular submission that will go down in history books alongside his record-breaking performance at UFC 216. The pound-for-pound king could continue his reign at the top for a very long time. Not only does he keep winning, but he keeps improving too. He looked unstoppable at UFC 216. Borg, despite his excellent scrambling ability and fast counter punches, stood no chance against such an evolved fighter like “Mighty Mouse”. He continues to improve every time we see him inside the UFC’s octagon. Ray Borg fought his heart out. The “Tazmexican Devil” tried everything he could to defeat Demetrious Johnson, but he wasn’t on the same level. His scrambling is just as good as advertised. Demetrious Johnson had a difficult time keeping him down on the mat. Johnson’s only real submission threat came from that incredible mid-air armbar setup. Borg’s counter punching is lightning-fast and powerful. It seemed as though Demetrious didn’t want to stand and trade with Borg in the later rounds once he got a feeling for how dangerous Borg can be. He has excellent defensive awareness. Demetrious never connected particularly clean with any of his standing shots in this fight as Borg was always actively defending.